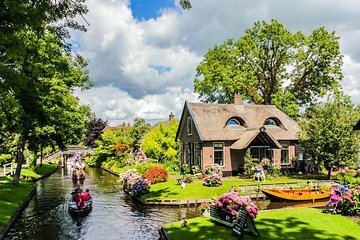 Visite a pitoresca cidade de Giethoorn em uma excursão de dia inteiro saindo de Amsterdã. Viaje de barco pela "Veneza Holandesa", onde você terá tempo livre para explorar e, depois, siga ao dique para vistas dos lagos e pôlderes, ou da terra recuperada. Veja, também, o Dique de Fechamento (Afsluitdijk), um dique de 32 km de comprimento que conecta as províncias da Holanda do Norte e Friesland. Além disso, você receberá um ingresso para um cruzeiro de uma hora pelo canal, para usar em qualquer momento da sua estadia. A excursão para Giethoorn dura sete horas e meia durante o inverno e nove horas durante o verão, quando uma visita ao Dique de Fechamento é incluída. Vá ao ponto de encontro central em Amsterdã para partida às 9h30. Depois, inicie a viagem de uma hora e meia até Giethoorn em um veículo confortável. Ao chegar em uma cidade onde não se entram carros, siga para um barco para uma excursão de uma hora pelos canais de Giethoorn, onde casas de fazenda restauradas ficam na beira do terreno, na margem das águas. Após a excursão de barco, você terá tempo livre para explorar por conta própria ou almoçar em uma das cafeterias de Giethoorn. Almoço não incluso nessa excursão, mas o guia pode ajudar a encontrar o lugar perfeito para comer. Retorne para a viagem até o Dique de Fechamento (Ijsselmeer), um dos maiores lagos na Europa Ocidental, onde você terá uma vista da água e da terra recuperada, as pôlderes que os holandeses drenaram e cultivaram por séculos. Beneficie-se com um ingresso gratuito para uma excursão de uma hora de cruzeiro pelo canal de Amsterdã (no valor de €16) como bônus para uso na cidade a qualquer momento durante a sua estadia. History of Enclosing Dike interesting. Boat ride was not good. 81 people were crammed into 2 boats. We were seated with out backs facing the front with a window and a wood pillar blocking my bride for one hour. Uncomfortable to have people sitting so close on back bench with occasional bumpimg if we tried to turn to see. Exploring the islandWas good, ice creamGood, prices in shops good. 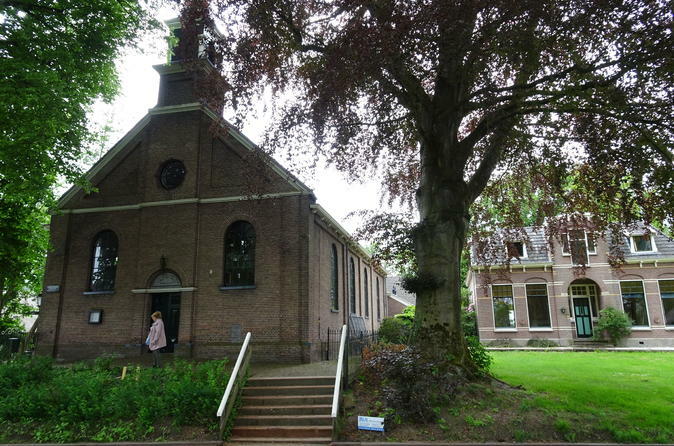 Wr really enjoyed our trip to this georgous little village, this trip is a must to anyone visiting Amsterdam! Beautiful place, quiet and unspoilt!Well worth the trip. Food at the Italian restuarant not good but otherwise amazing. Tour guide was noce. Beautiful little town. We enjoyed the boat tour. Then we had three more hours to walk around and look at the same thing. I would not recommend this trip. I enjoyed this day trip- gave some variety to my Amsterdam trip and even though I love the hustle and bustle of a city, this was a nice change. The village was very interesting and I enjoyed the boat ride. Compared to other tours I found this one very relaxing and not rushed at all. The bus ride is not long and we had plenty of free time to explore Giethoorn, Also, often on these tours there is no time to eat or you just grab something quick for lunch- not the case at all for this tour. We had plenty of time to have a nice lunch in a restaurant. Beautiful paradise outside the city. Tour guide gives you more than 3 hours of free time with the opportunity of renting your own small boat and explore around the canals or biking. We had an nice trip to Giethoorn. It is a pretty and picturesque location. We went for a boat ride as part of the tour, later we went on our own for a walk and had a leisurely lunch. A laid back and enjoyable day. Gisthoorn was great And it was neat to see the cute village of Giethoorn by boat but we feel the tour operator Lindbergh stretched it into a full day to charge more. We spent 4 hours or more in a bus looking at nothing but flat farm fields to see the inland sea dike. There was nothing to see??? Also we had too much free time in the tiny village to shop or eat lunch. This tour needs to be 5-6 hours. Drive to Giethoorn, take boat ride, 1-2 hours free time return to Amsterdam. Tour guide was fine, boat guide was good and enjoyed the village for 1 1/2 hours.